There’s always a moment in every successful playoff run that stands out. The play that catapulted the championship team from the middle of the pack to the team that couldn’t be beat. For the Chicago Blackhawks in 2013, the moment where captain Jonathan Toews headed to the penalty box and teammate Brent Seabrook poked his head in and patted him on the shoulder to calm him down was important. In 2014, the Los Angeles Kings probably look to a few of Jonathan Quick’s saves in Game 5 against the San Jose Sharks, which was a 3-0 shutout victory. For the St. Louis Blues in 2001, it could have been a goal from an unlikely source in Game 5 of their Western Conference quarterfinal series against San Jose. Just one season after the eighth-seeded Sharks defeated the President’s Trophy winning Blues, the two teams met up again to settle the score. Deadlocked in a 2-2 series tie, the Sharks took a 2-1 lead in Game 5 to the waning moments of the third period. Gritty winger Dallas Drake tied the game late in the third period to make a brand new game and send it to overtime. At 9:54 of the extra period, center Pierre Turgeon won an offensive zone faceoff back to rookie defenseman Bryce Salvador. The 25-year old unloaded a slap shot that eluded goaltender Miikka Kiprusoff to give the Blues a 3-2 series edge. The Blues defeated the Sharks in Game 6 and went on to sweep the Dallas Stars in the second round. However, they ran into a destined Colorado Avalanche roster that took the Western Conference Final in five games. The stacked roster went on to defeat the New Jersey Devils in the Stanley Cup Final. 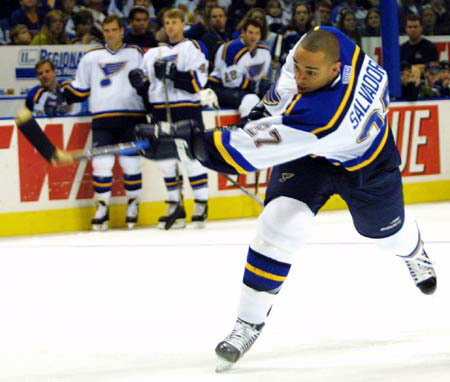 Salvador’s goal stayed fresh in the minds of Blues fans for some time. He remained with the team through turmoil and distress, which included the retirement of Hall-of-Fame defenseman Al MacInnis and the infamous trade that sent Chris Pronger to Edmonton, becoming a staple in the Blues’ defensive core. The 1994 sixth-round draft selection was traded just before his contract expired to the Devils in exchange for Cam Janssen on Feb. 26, 2008. He signed a four-year, $11.6 million contract extension with his new team while the Blues management added the finishing touches to the franchise’s rebuild. Since the last time he skated with the St. Louis team, Salvador is seeing quite the different team on Scottrade Center ice. It was the seventh time that Salvador faced his former team since his departure. The Devils now have lost five of those seven games, including two consecutive losses in a home-and-home series with the Blues this week. Right winger Vladimir Tarasenko continued his hot start to the season, scoring his eighth goal in six games after beating Devils goalie Cory Schneider on a break-in after a turnover. The Blues added to their lead in the second period when forward Jaden Schwartz outgunned Schneider on a breakaway. Both teams traded goals in the third period, but it wasn’t enough for a Devils team that has posted a 4-5-2 record in its last 11 games. Although it was the final time the Devils and Blues will meet up this season, Salvador was hoping for a more favorable ending to the West-East matchup. Despite the losses to the Blues, Salvador has moved on to have quite the career with the Devils. 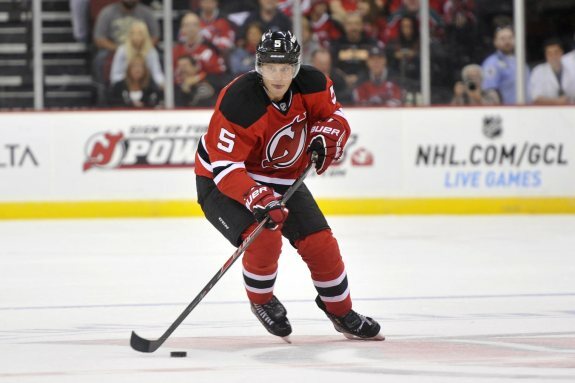 He was named captain of the team on Jan. 17, 2013 after an appearance in the 2012 Stanley Cup Final for the Devils. Despite losing to the Kings in six games, Salvador made a name for himself… literally. Salvador took exception and went as far as labeling the water bottle that all blueliners share with the phrase “no-name defense.” Teammate Mark Fayne, now with the Edmonton Oilers, seemed to enjoy Salvador’s interview with that very analyst shortly after his comment. “And when he came on he said, ‘I’m surprised you know my name,'” Fayne said. A chip on his shoulder and the dedication to lead his team to the Promised Land is likely what earned Salvador the “C” on his jersey a season later. Salvador’s demeanor in the locker room and ability to lead his team on the ice can likely be credited to his upbringing, the WHL’s Lethbridge Hurricanes coaching staff, and past teammates. There’s one mentor in particular that Salvador recalls — former Blues pairing partner Al MacInnis. The Devils currently employ four defensemen under the age of 24. One player, Damon Severson, only has 13 NHL contests under his belt after Thursday. Salvador has taken what he has learned from his former Blues captains and re-gifted the teachings to his impressionable skaters. The memories of his St. Louis days are aplenty. The big overtime goal has to stand out, but there’s one play that matters the most to him: his first goal as an NHL defenseman. “It was against Chicago,” he said with a smile, mentioning his tally on Dec. 10, 2000 in a 6-1 St. Louis loss.